The wording of most temporary street signs fade from our memories almost as soon as we pass by, but a friend of the Brod Firm reports a sign, posted by a construction zone, that stuck in her memory for decades: “Temporary Inconvenience for Permanent Improvement.” Most of the time construction zones are simply that, a source of headaches in the short term that hopefully lead to some form of long-term improvement. However, when drivers fail to take needed precautions, the nuisance of roadwork can become much more dangerous and lead to a potentially fatal accident. Our San Francisco construction zone accident attorney can help victims of these all-too-common accidents but also knows that prevention is always the best option. Construction zones can be dangerous for both workers and the motorists who pass through road construction areas. According to statistics presented by the Federal Highway Administration (“FHWA”), there were a total of 87,606 work zone crashes in 2010, with 30% of these crashes involving some form of injury. There were 514 fatal work zone motor vehicle crashes in 2010, causing a total of 576 deaths. This translated into one vehicle-related work zone fatality every 15 hours. A 2008 study found that speeding was a factor in 31% of fatal work zone accidents, alcohol a factor in 20%, and lack of seatbelt use played a role in 53% of work zone vehicle fatalities. In the same study, 41% of the fatal incidents were rear-end collisions (compared to only 16% of all fatal accidents). A Center for Disease Control report notes that the highest number of fatal work zone accidents for 2009 occurred in Texas, Florida, and California. Taking extra precautions can improve the safety of construction work zones for both workers and commuters. Drivers should always obey posted speed limits and watch for temporary signs alerting drivers to changing conditions. Drivers should pay special attention to locations where traffic merges, avoiding last-minute lane changes while watching for less attentive drivers. Overall, attentiveness can be especially important in areas an individual driver frequents, since construction can change what may usually be a routine commute; it is important for drivers to shift out of auto-pilot and be alert to changing conditions. Remember that construction vehicles may be slow-moving, can have significant blind spots, and cannot always respond quickly to changing conditions. Also, keep in mind that the noise of heavy machinery and the use of safety equipment may make it difficult for workers to hear surrounding traffic. 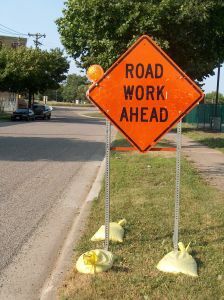 For more information on work zone accidents and work zone safety, see the FHWA’s Work Zone Safety for Drivers brochure. The brochure is from 2003 and mobile phones receive only a passing mention, a fact that brings to mind one more tip: Avoid the temptation to text or hop online when construction leads to “stop and go” conditions or other delays. Failing to stay vigilant and remain attentive can have tragic consequences. Construction is a necessity — failing to perform needed roadwork can lead to dangerous road conditions and our roads need to change with changing use. Exercising caution can help keep construction zones safe. Where another driver failed to exercise due care leading to an accident, our experienced San Francisco work zone accident lawyer can help. We can also help if the construction area was poorly marked, poorly lit, or otherwise unreasonably dangerous. Our firm handles the most serious of cases, including catastrophic injuries and wrongful death matters. Most cases are handled on a contingency basis, meaning you only pay if you recover compensation. An initial consultation is always free.